I’ve been a bit quiet on here lately. Not for any other reason they I just didn’t feel like I had anything important or worthwhile to say. Brad and I have been out for breakfast a few times in the past few weeks and I have still been cooking up a storm in the kitchen, namely clean eating stuff but a few treats also. Now I have written homesick but really it’s just a craving for creature comforts I grew up with back in Wales. 5 years ago when I first came here I craved three things so badly! Next was the curry, Brad and I decided that we would venture out into Hamilton and find someone where to eat, midweek. We walked for a few moments down Beaumont Street when we stopped and looking into a shop front window, this is how we found, Indiana Raj. From the outset it looked like someone’s living room, but we decided to give it a go and walked in to literally be greeted by the whole family. We were seated and ordered and oh my goodness did my taste buds do a little dance!!! This food was amazing and the experience didn’t stop there! After dinner, the music paused before following on with a loud bollywood track and the staff/family members encouraged all the patrons to get involved with a makeshift bollywood dancing class! Well, what fun I had, but I’m pretty pleased I’d had those 3 glasses of red wine prior! 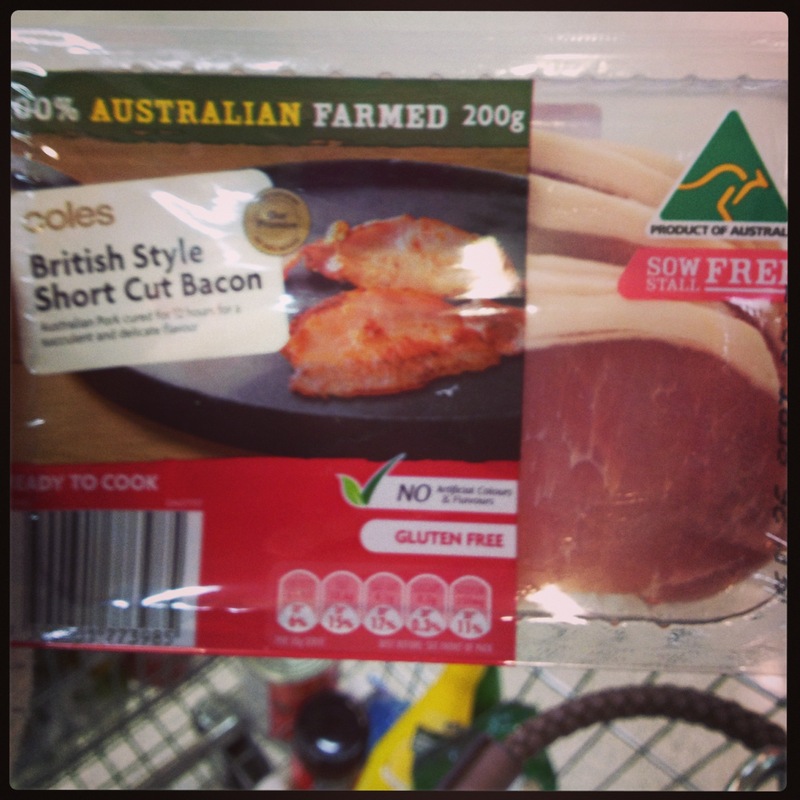 And lastly my search for British, unsmoked bacon. When Brad and I went back to the UK for our wedding, I had been in Australia 11 months. My mum asked me what I wanted in her flat food wise for when we were there. 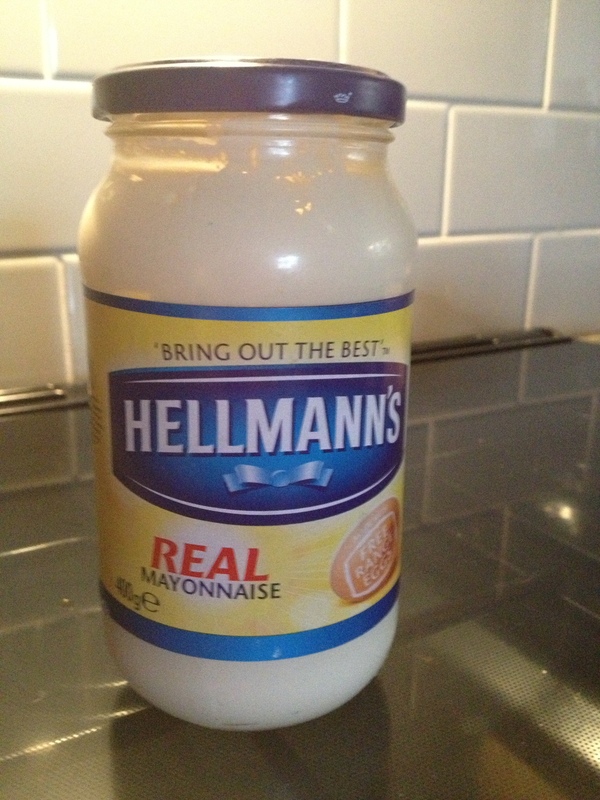 Hellmans and Bacon were on the top of the list. Once Brad had his first taste of unsmoked British bacon there was no turning him back. He was a convert and walked miles every morning just to buy more bacon for us to have for breakfast. We have not stopped searching for butchers in Australia who would leave this cut in it’s purest form and yet we constantly failed. I have been in Australia 4 years and 11 months and I had all but given up hope of ever achieving final tick on my list of three. Last weekend I needed to go to a different shopping complex to pick up my engagement ring that had been in for a clean. I decided as I was there I would just do my weekly shop in the Coles. I was slowly pushing my trolley around as I had never been here before and I was concerned I would miss important food items, when a reduced sticker on a pack of pre-packaged bacon caught my eye! Usually I get my bacon from the deli counter, but if there is a deal to be had I love getting them, so I walked over to the fridge and picked up this packet bacon to study it further. LOW.AND.BEHOLD the label read “Authentic British Bacon” Oh wow did my heart start racing, I checked the bacon itself and YES it was raw! There as a deal on the “not coming up to used by date” two packets for $10 so I through the reduced packet down and grabbed two fresh packets. How I couldn’t wait to get home and show hubby! We actually froze the two packets and had it for breakfast the following weekend and it was DELISH! So there you have it! I have achieved everything on my tick list for things I really would like in my life here in Australia and less than 5 years have achieved them all. Yum yum yum! I just think it’s going to make me very poor buying $7 mayo and $10 for 500g of bacon! Over the last week I have really tried hard to maintain a “clean eating” diet and it’s been received well by Bradley! 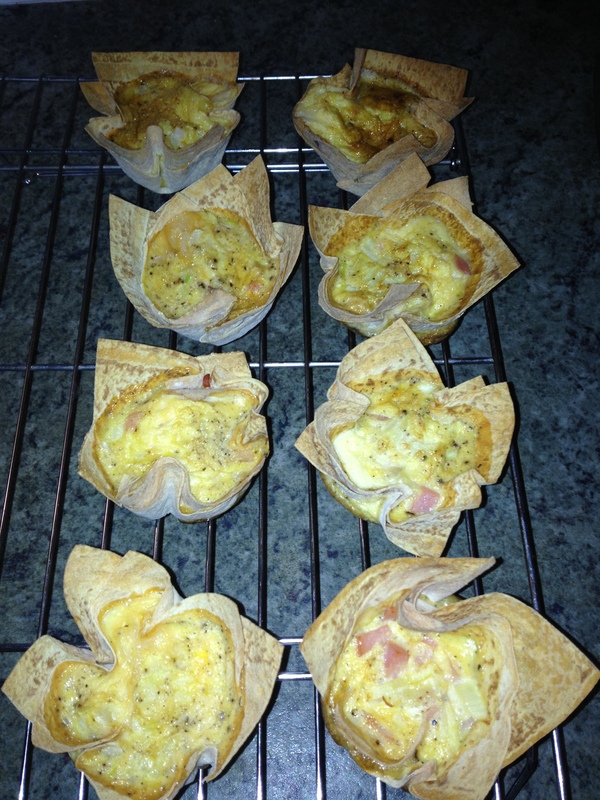 The first thing I made last week were my clean eating mini quiches! Brad actually asked “where did you get these from?” when I fed them to him whilst he polished my car. Needless to say I was pretty chuffed with that reaction! Considering they are made from mountain bread wraps, egg and whatever you would like to put into them, they turned out amazing and you can keep them in the fridge for 4-5 days! You can get that recipe here. The next dish I wanted to try was a twist on the good old comfort food of meatballs. Well, the only twist is using the super lean meat of kangaroo! These were absolutely amazing (or as the in crowd now say Amazeballs!) The gameyness of the kangaroo went so well with a beautiful rich tomato sauce and was complemented by the selection of herbs. I was going o make spaghetti for Brad and I was just going to have some steamed veggies but I’m pretty hooked on quinoa at the minute so made a little batch of that to go with them. Again, this was a dish that brad enjoyed and even had enough for work the next day! 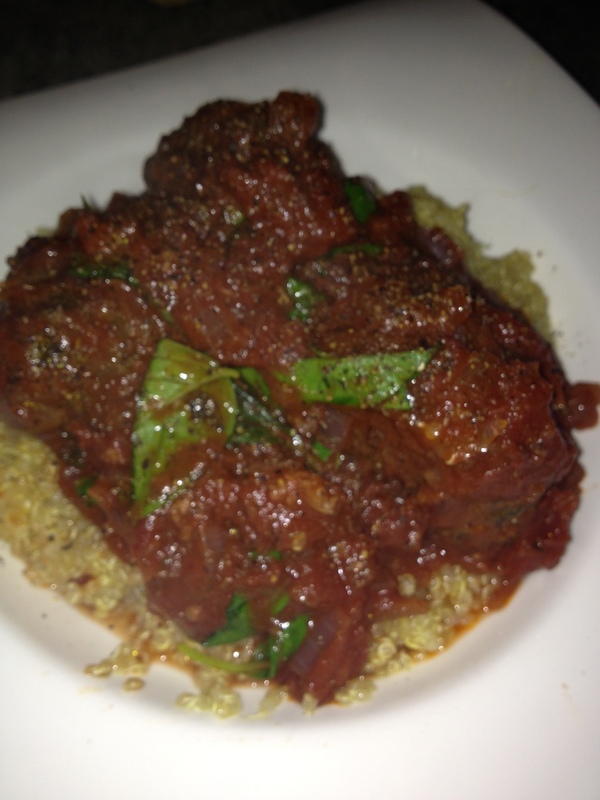 You can check out my kangaroo meatball recipe under the red meat tab! The last recipe for this update was a dish that a work colleague got me onto. 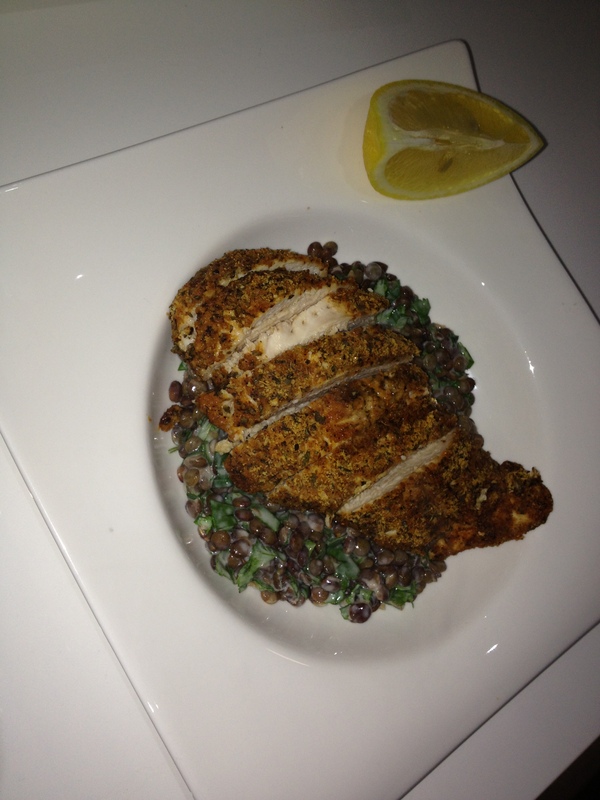 Chicken with lentils. Of course, me being me, had to adapt the recipe and it turned out amazing. When I told my colleague about the almond meal crust she was adamant that she would use this recipe next time! I’m so please she put me onto this recipe as not only is it clean it’s SUPER fresh and yummy and perfect for a hot summer or warm spring afternoon dinner! This recipe is under my chicken tab. I hope you enjoy this first clean eating segment of my blog. There is much more to come like my Parsnip fries for example! Delish! Brad and I tend to eat a lot of meat. I think it has something to do with the fact that Brad thinks he is a pure carnivore and not a herbivore at all! If Brad could get away without eating any vegetable I believe he would choose this option. Me, however, when I came to Australia it would have been very easy to slip into a “comfort food”, “non veggie” type of diet as it was the first time living out of home! I did, however, think back to what is good for you and made an elected decision to eat lots of veggies and fruit. I know Brad would agree that he is thankful that I plate up mounds of veggies on most evenings, sometimes even ones he has expressed a dislike too (Egg plant/Aubergine, Squash, asparagus) but he eats them. I don’t serve him sweet potato as he really dislikes that which is a shame because I love it and it’s a GREAT alternative to normal potato. I have on occasion mixed normal with sweet potato just as a compromise! I find fruit harder to consume then vegetables, maybe its the time it takes to prepare? Or the fact that it is cold? With veggies, I guess you prepare them as you prepare any dinner where I don’t know anyone who has fruit salad all the time for dinner or lunches? Fruit generally, in my eyes, just takes more effort overall to consume. So this leads me to Meatless Mondays. I think I saw this somewhere on the internet whilst I was looking for a funny wine meme or something along those lines. The two words “Meatless Monday” stuck and I decided over the weekend that I was going to uphold this. I did however have turkey mince at lunch time so have decided that it will just be our dinners on a Monday that will become meatless. To ease Brad into this I decided on a Spicy Indian Dahl with pumpkin, which would have been great on it’s own, but I did spice up some fish and baked it before adding it into the Dahl. This dish is DELISH! I mean it! Although it took about an hour to cook it was well worth the wait! The texture and flavour that oozed out of those little lentils was amazing, the plain basa fish coasted in dried spices really works a treat and overall was a hit with hubby and I. There was even enough left over for lunches the next day (dahl and pumpkin only). So watch this space for more meatless Monday recipes and experiences! Leftovers – keep them or chuck them out? How often do you catch yourself serving up enough rice to feed a small country or carving up a large roast bought for 3 but could easily feed 7? Do you try and stuff it in so not to waste or do you think about reusing it in a creative left over way or do you just simply throw it out without a care as to who could have enjoyed your hard labour of cooking? Up until about a year ago I was terrible for cooking far too much rice. Too much to the point that when feeding 2 I could have easily fed 10. I think it’s more about how small it looks initially and then remembering how much it expands after cooking! I now know just 1 cup of uncooked rice is enough for me and brad and there will be a little left over in case I over do it with the main dish I am serving up with this said rice and therefore I will be able to box it up and freeze it, or Brad will have a scrummy lunch for the following day. The problem I am finding now though is I have no care about how much I am cooking because “I will just freeze it” but it has transpired that I have had to buy a chest freezer just to contain the “leftovers”. It’s all well and good, and I do it with the best intentions, but because I love cooking so much I struggle to allow myself to partake in one of these mystery boxes that lurk in my freezer. So I am now left with this conundrum, I cook and I do every evening try and think of something different to do. I always over cook what I am doing and therefore have to box up my leftovers and yet I can’t bring myself to get them out of the freezer and eat them as I could/should be cooking as I want to! Does anyone else have this issue? Do you have a freezer full of food that is slowly getting frost burn because no-one is interested in eating your labours of slaving over a hot stove? Do you intentionally cook more with the great idea that you will eat this at another date and yet never do? Or are you able to cook for two and actually only cook for two, have no stray rice hanging out in the sieve? Somebody please tell me I’m not in this alone! 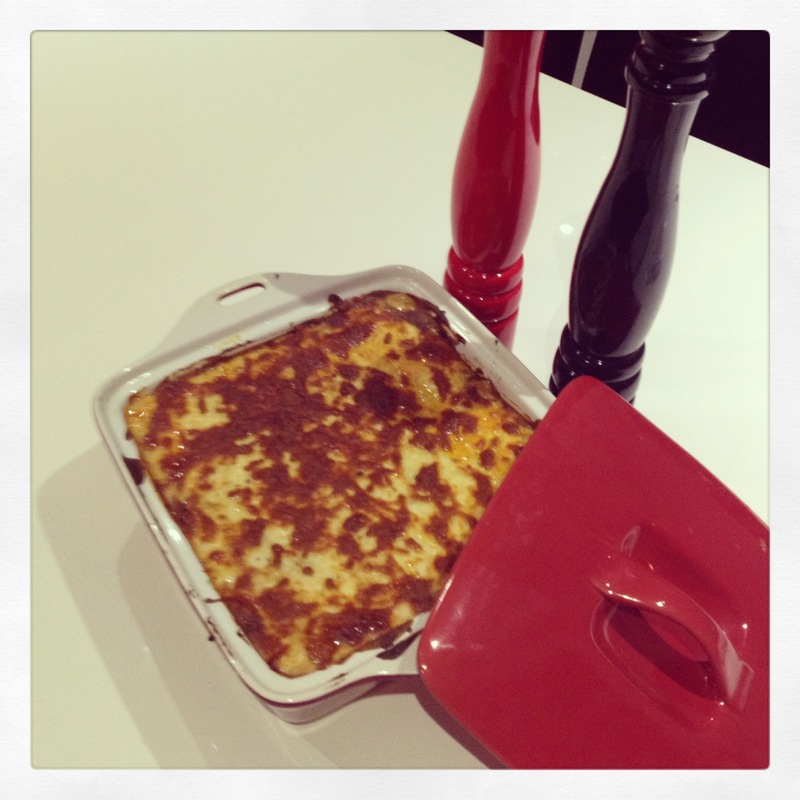 Last night I attempted my first ever lasagne. Pretty crazy considering I’m 28 years old and I love cooking all different things but I think that is where I was at with a good old, trusty, winter warming lasagne. To me it was just boring. I have watched my husband on a couple of occasions attempt this mean feat of a lasagne where he has had the meat and sauce bubbling away for hours, the white sauce is measured to perfection and tweaked and sprinkled with nutmeg and only the best parmesan cheese was to be used! My darling husband does not react well when things he makes goes wrong. I have told him on so many different occasions that I am the cook of the house and he is the baker! I have NO patience what so ever to measure out exact amounts of flour to ratio’s of sugar or even to the point of separating egg yolks from whites…….but I can however create a wonderfully tasty, satisfying and amazing dish from taste testing the whole way through and making it my own. So last night I decided to take on the lasagne. Reason, if I’m completely honest, was that I needed something to cook all afternoon to warm my house up and we had both lamb and Angus beef mince in the freezer so I was already winning! I defrosted the mince and chopped up the onion and garlic. I just LOVE the smell of frying onion and garlic together so delicious and gets those sense tingling! In went the meat and following that pretty much everything else! I measured the wine out at one cup and then decided it could do with a glug more – this was after I had had a glass to myself!! I simmered it away until all the liquid had disappeared and I made my white sauce along side on the stove top. I used gluten free lasagne sheets which was lovely but needed more cooking time and therefore I would just suggest using normal sheets unless your gluten intolerant and if that’s the case leave a little more liquid in the sauce it’s self so I can cook through! I added a whole bag of baby spinach and wilted that down in the meat mixture as I knew Brad would decline veggies with his lasagne. It was pretty delicious and I’m pleased I can now add lasagne to my repertoire!! I rang through at about 6pm and as always the beautiful Chinese daughter, who would only be about 8 years old, answered the phone and took my order, polite, professional and understood everything. The order was made in Bradleys name as I knew he would go and get the food later on. $48.80 later we have 3 dishes, one bag of prawn chips and a rice to boot and we are all cowing down on our Chinese with, might I add, chops sticks! Now, don’t get me wrong this hasn’t always been a love/love relationship with Mr Foongs, when we first moved into our house we were craving a good old fish cocktail and chips. Mr Foongs also advertised that there was another take away in their establishment called “Peters Takeaway”. 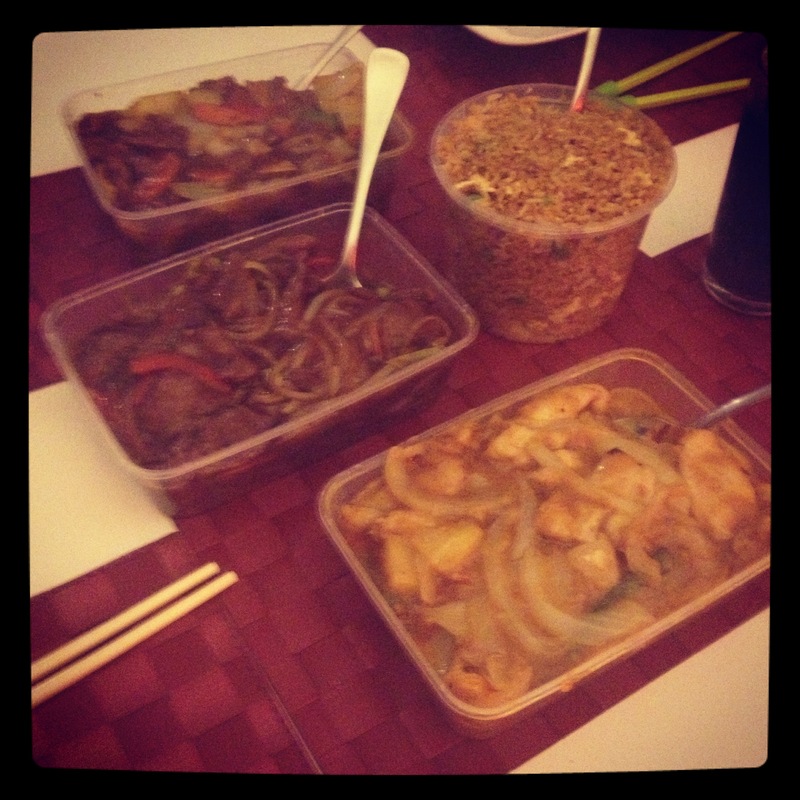 So we thought, “well the Chinese is pretty good lets go there for western food”. Boy, were we wrong! The cocktails were something that had been cooked and left for a good few hours, the batter soggy not just soft and the fish completely dry inside. There was no flavour throughout and the chips lacked their vavavoom of shop bought chips. an overall disaster. Anyway, everyone loved their Chinese treat. As I’ve said before I always try and cook my step children something healthy and nutritious as I don’t believe they get that at home. So when I sit back and let take away get ordered they are pretty excited! As the kids washed up, Brad and I sat back on the lounge and chilled out after our long week of work. For Saturday a colleague of mine Victoria, had organised a “pamper afternoon” where a consultant of a company came in trying to flog their wares and we all got to have a play with it all 🙂 I asked Victoria if it was all good for Katie to come along too. All was fine. With me driving and Katie only 12 I decided to invest all of $8.69 into a bottle of non-alcoholic champagne as I knew the rest of the girls would be drinking proper champagne! 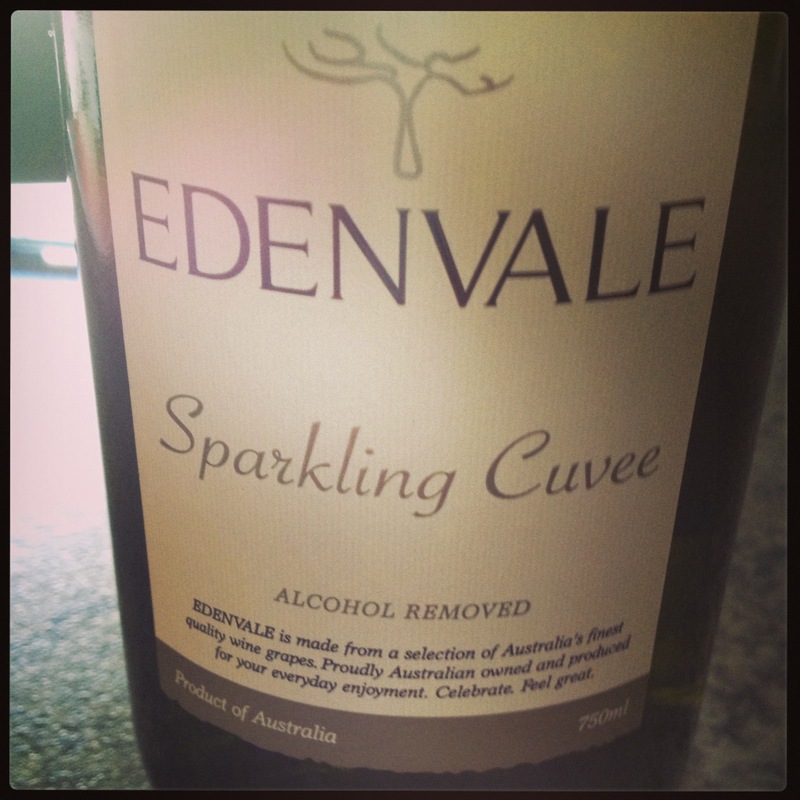 To be completely honest, although the Cuvee was a little on the sweet sick it was actually pretty scrummy! I’m surprised not more pregnant woman aren’t opting for this?! 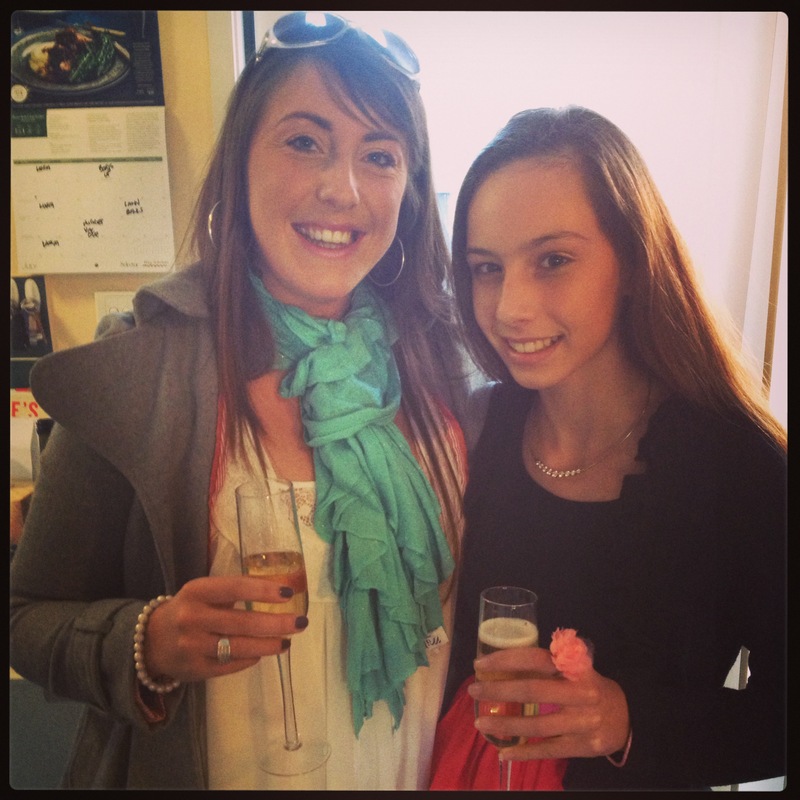 I was drinking bubbles, out of a glass and the best part was I didn’t wake up with a hangover this morning! We left a little late but we weren’t too concerned as Bradley and Mitchell had opted to cook dinner for us all that evening! Great! So we all drove the 1 hour journey home and was greeted with a big kiss and a large glass of shiraz! Yummy! 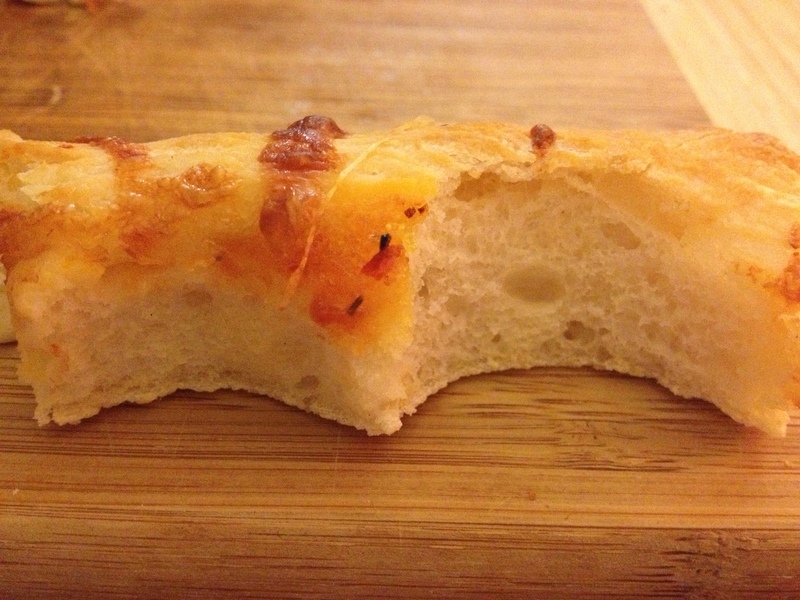 Brad has perfected his pizzas and I will eventually get a recipe for you for his bases as they came out AMAZING this time around. 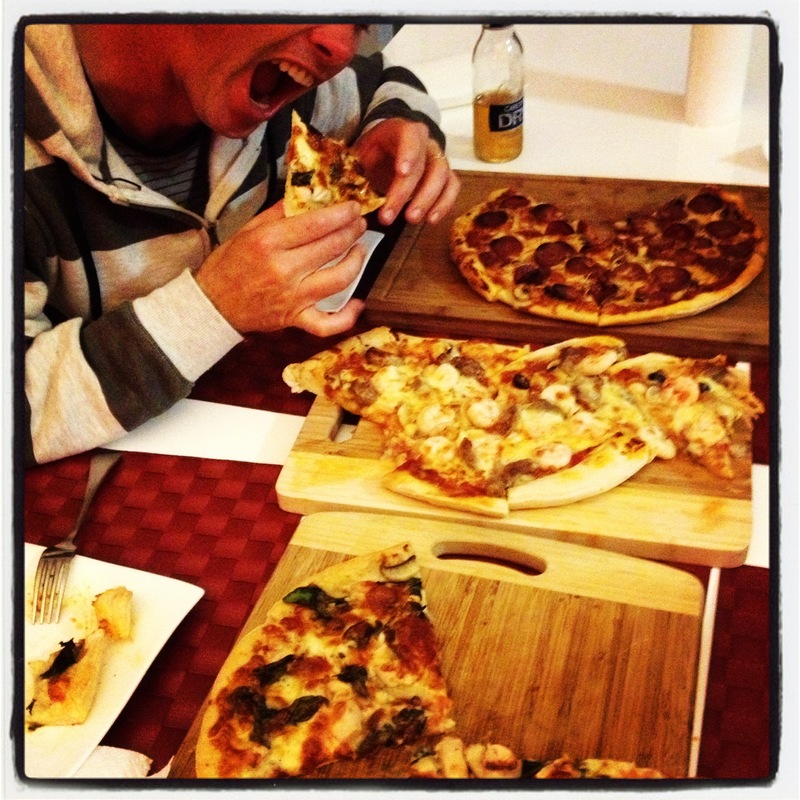 Brad made three different pizzas for us, a pepperoni with extra, extra pepperoni, a surf and turf and my favourite a creamy based chicken and mushroom! YUMMY!! !